grains as materials to produce extruded snacks, with crispy taste and lively shape. 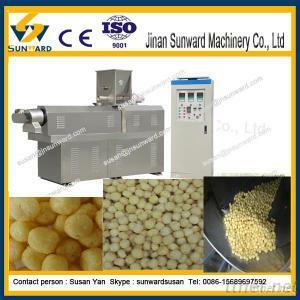 3. co-extruded snacks food machine is from feeding, extruding, core filling shaping ,cutting , oil spraying to finished products are done once time automatically. 4. snack food cheese production line can produce all kinds of inflating foodstuffs, rice bread, core snacks, crackers, gruel nutrient-flour, and baby food and so on. 6.The forced lubrication system, by guaranteed equipment transmission longer life. direct-viewing, parameter to be more precise.